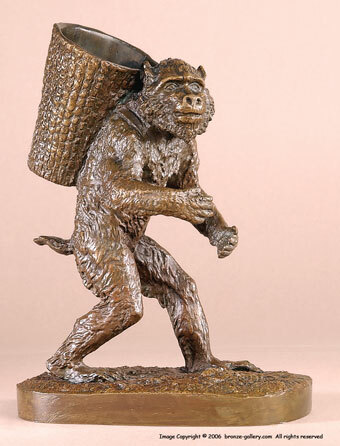 One of Fratin's specialties was in creating humanized animals. 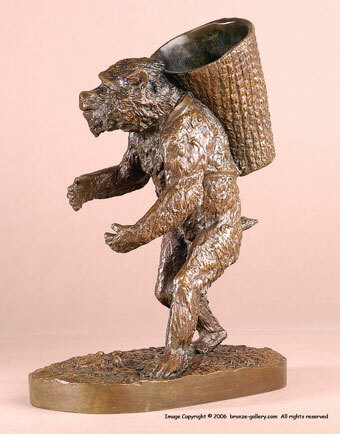 He did many small sculptures of Bears doing human activities and a few of Apes and Monkeys acting like people. These humorous sculptures often poked fun at every day human activities. This unusual bronze shows a large Ape or Monkey carrying a woven basket on his back, probably depicting a wood gatherer. The basket could be intended to be a matchsafe or just an amusing sculpture. The bronze has a warm brown patina and is a sharp cast of this rare model.